My cookbook collection has swelled to enormous proportions recently, almost outgrowing its home. Poring through my books to find just the right recipe to suit my mood is one of my greatest pleasures, but often time just doesn't allow that. On weeknights, I've been grabbing the Steamy Kitchen Cookbook more and more. Every recipe I've made so far from Jaden's book has been exceptional. This one was perfectly simple for a weeknight, and felt light and healthy too. Serve it over steamed rice for a one-bowl meal. 1. In a large bowl, make the cornstarch slurry by stirring together 2 tsp soy sauce and cornstarch until the cornstarch has dissolved. Add the chicken and toss to coat well. Marinate for 10 minutes at room temperature. 2. Set a wok or large frying pan over high heat. When a bead of water sizzles and evaporates upon contact, add the oil and swirl to coat. Add the chicken slices in 1 layer and cook for 2 minutes, flipping halfway. Remove chicken from the wok, keeping as much oil in the pan as possible. The interior of the chicken will still be raw, it will get added back to the wok soon to finish cooking. 3. Lower heat to medium and add shallots and garlic to the pan. Stir-fry for 30 seconds. 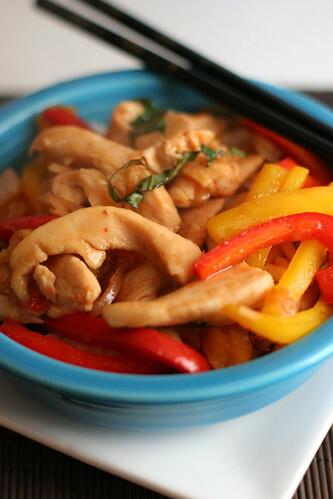 Add bell peppers and continue to stir-fry for 1 minute, until peppers are softened but still have a nice crunch to them. Pour in the fish sauce, soy sauce, and chili sauce and stir well. Add the chicken back into the pan and let the entire thing simmer for 2 minutes. The chicken should be cooked through (cut into a piece to check) and the sauce should be glossy and thickened. Turn off the heat and stir in the fresh basil leaves. Ooh, that sweet chili sauce sounds really tasty. I actually just made chicken stir fry with brown sauce last night. I love all the options you have with a stir fry. Yum. Jaden is a wonderwoman!